All-in-one MIG for portability and flexibility. Diamond Core Technology delivers a superior arc with a wide welding output range. Great for small jobs, ease of use and portability. Industry-standard AC/DC for exceptional performance. Gas tungsten arc welding offer AC and DC TIG welding on aluminum and other metals. 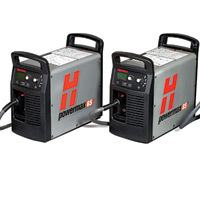 Hypertherm’s Powermax line of plasma systems will help you get your cutting and gouging jobs done faster, easier, more reliably and at a lower cost. Commercial and industrial engine driven welders provide stick, TIG and wire welding in even the most extreme environments. Rugged engine drive is the standard for Stick and Flux Cored welding. Has the power and key features that help you turn a profit.